Pedro Nasta wins the Texas Invitational (Photo: James Schleicher). 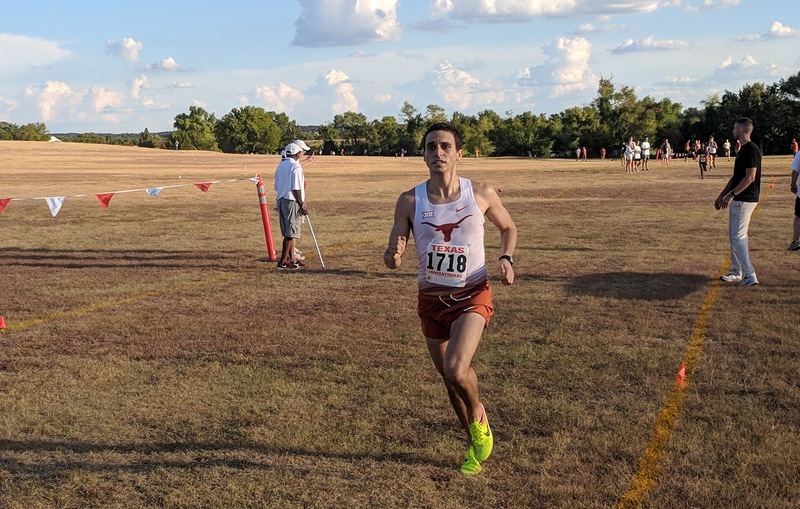 Busting off the rust from a summer without competition, the Texas Men’s and Women’s Cross Country teams took their first strides of the season as they hosted — and won — the Texas Invitational at Old Settler’s Park in Round Rock last Friday evening. Both the men’s and women’s teams won the team category for their respective races, which included competitors from Texas Southern and Prairie View A&M. Junior Destiny Collins and senior Pedro Nasta put up individual wins for the women’s and men’s races, respectively. Collins led the Women’s team with a first-place finish in a time of 12:58 on the four-kilometer course. 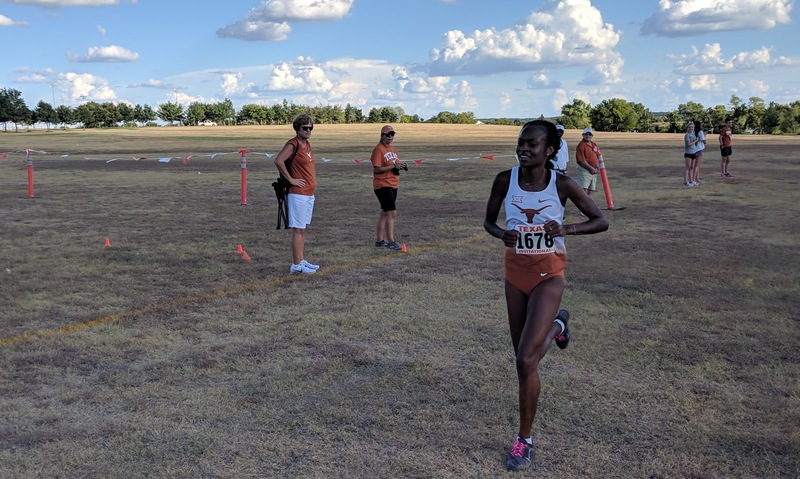 Senior Destiny Collins wins the Texas Invitational (Photo: James Schleicher). Collins enjoyed the win and felt like she accomplished what she had hoped in the season opener. The women’s team had almost all of their team competing in the event, with 20 runners entered, which gave Plumer a chance to gauge her team’s status based on the results from the same meet at this time last year. One of Plumer’s goals, for her top 10 runners to finish under 14:30, actually came to fruition better than expected as Texas’ top 13 runners finished under 14:30. On the Men’s side, Nasta finished first with a time 15:06 on the five-kilometer course. Having not raced since the Big 12 Championship meet last fall, due to injury, Nasta said he loved racing again. Only six Longhorns competed with the meet primarily serving as a chance for some of the younger runners to get their feet wet. "That was a nice way for Pedro to start his season," men's cross country coach Pete Watson said. "He showed up determined for a result and got it. It was the first time in a Texas uniform for many of the guys and they got to leave the meet with a win. That is a positive way to start their careers." Nasta said he gave the younger runners some advice about the early season race. The teams had the support of many of their track and field teammates as well as friends and family members. Overall, approximately 75-125 fans primarily wearing burnt orange came out to support the runners. With the hiring of new head track and field coach Edrick Floréal, both the women’s and men’s cross country teams also received new head coaches who will also coach the distance squads during track season. Floréal led the group of track and field athletes in cheering for the cross country runners. For Plumer it meant lots of new faces, while the cross country squad had been training for two weeks prior, many of the other track athletes had just arrived on campus a couple days before the meet. Both Collins and Nasta said their teams have been adjusting to the new coaching staff and their routines. Nasta is among a group of five seniors who will play a key role in the Longhorns’ season. The men’s team returns it’s top six runners from last season, including All-Big 12 performers Sam Worley, Connor O’Neill, Alex Rogers, John Rice and Charles Mills. Last year UT finished one point shy of the Big 12 title, then finished second at the NCAA South Central Regional meet. The Longhorns qualified for NCAA Championships and finished 30th. Texas is ranked No. 2 in the regional preseason poll by the USTFCCCA. On the women’s side, six of the top seven runners return including All-Big 12 runners Alex Cruz and Destiny Collins. Last year, UT finished third at the Big 12 Championships and second at the NCAA South Central Regional Championships, qualifying for NCAA Championships, where the team finished 31st. The women are ranked No. 2 in the South Central Regional this preseason by the USTFCCCA, as well as No. 27 nationally. “We look really good in workouts so I’m excited to see how it comes together,” Collins said. Cross Country will continue its season today at the Rice Invitational in Houston. The first big test of the season will come when the Longhorns head to Wisconsin Invitational in Madison Wisconsin on Sept. 28th.